This movie expands into many more movie theaters this weekend, so we are reposting David Edelstein’s review. Steve McQueen, the director of the wildly acclaimed adaptation, 12 Years a Slave, has a specialty: He likes to fix his camera on a person in extremis — starving to death in Hunger, shaming himself sexually in Shame, and now being tortured by monstrous white slavers in the South. His shots are high-toned, mythic, frieze-dried. They’re intended to induce ­claustrophobia, physical and existential. McQueen’s images have considerable power, and I’d watch his films less guardedly if I thought he were searching for something more than his characters’ reactions to extreme degradation. In this case, at least, he has found a milieu in which a feeling of entrapment should — and does — permeate every frame. The painterly malignancy is unrelenting. Solomon (Chiwetel Ejiofor) stands in prison awaiting his sale, and his white shirt glows like the central Inquisition martyr’s in Goya’s Third of May. As each new white character is introduced, we’re apt to search his or her face for a sign of compassion or empathy, only to be walloped by the general inhumanity — as Solomon is literally walloped by a hitherto avuncular-looking Paul Giamatti. The benevolent Ford (Benedict Cumberbatch) only half-rises to defend his slaves’ humanity before fearfully settling back into the status quo. But life is far worse when Solomon arrives at his final plantation: the house of Epps (Michael Fassbender) and his Gorgon of a wife (Sarah Paulson), whose overriding goal is to see her husband’s prized slave mistress, Patsey (Lupita Nyong’o), suffer. Critics have proclaimed ­Fassbender’s Epps an incredible performance, and it is — in its way. He declaims, he barnstorms, he seizes the space. He’s a predator whose moments of friendliness elicit thoughts like Gee, Grandma, what big teeth you have. ­Fassbender leaves no doubt he’d be a superb Richard III or Macbeth — or werewolf. But his high theatricality keeps him at the level of melodrama. He doesn’t solve the riddle of this terrible man. As his spouse, Paulson does something more interesting. Mistress Epps often tries to affect a mask of kindness but is thoroughly poisoned by jealousy. Punishment of the slave on whom her husband fixates becomes an addiction. John Ridley’s screenplay has fancy period dialogue and is generally faithful to the facts, and the acting befits the high stakes. Cumberbatch gives a finely detailed portrait of a man who cannot reconcile two contradictory ideas: that slaves are human and that they are chattel. Alfre Woodard has a startling scene as a former slave who has become a “Mistress,” the common-law wife of a white man, and luxuriates in the way she has gamed the system. The movie’s low point is the appearance of co-producer Brad Pitt, cast as a golden-locked carpenter — a savior — who listens to Solomon and says, “Your story — it is amazing and in no good way.” It would have been more interesting if he’d gone against the grain and played the ­conscienceless master. Ejiofor has been overdue for stardom since Dirty Pretty Things, and he’ll get it now. He’s the kind of great actor who can work in pantomime, conveying terror and anguish with the angle of his shoulders and the level of his head. At times he wears his disgust too visibly for a man who has supposedly learned to keep his head down, but the struggle to remain inside himself is vivid. McQueen builds two particularly stark images around him. In one, Solomon stands in the center of the frame with a noose around his neck, saved from death for striking an overseer but left to choke for hours on tiptoe while business goes on — and slave children play — behind him. Even more unnerving is a scene in which Epps hooks his arm around the neck of Solomon—betrayed after an attempt to post a letter to New York — with demonic intimacy. I realize there’s a danger in suggesting that McQueen is guilty of overkill: that it could be taken as an attempt to say “Slavery wasn’t as torturous as all that.” The hell it wasn’t. 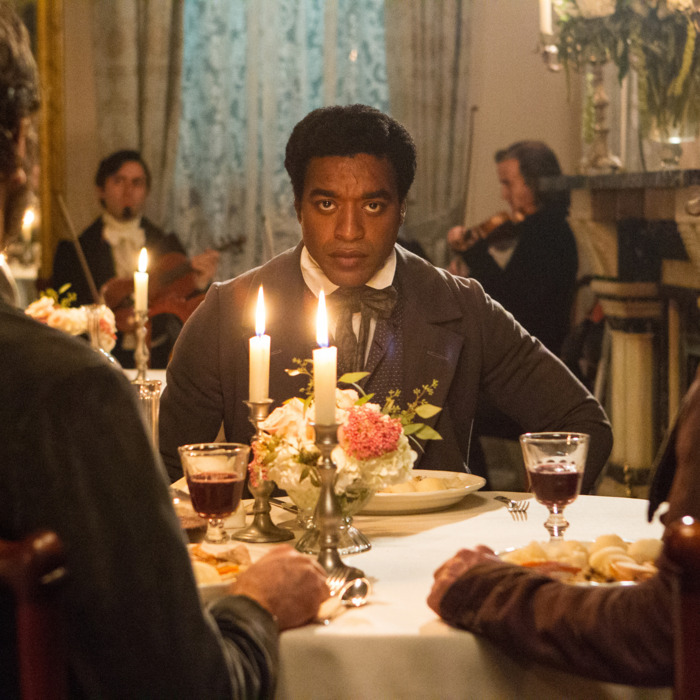 From a political and humanist standpoint, there are plenty of reasons to champion 12 Years a Slave. In his book, Northup directly addresses an audience that (mind-bogglingly) still exists — the one that insists that many slaves were happy in the bosoms of their masters. It should shame people with Confederate flags on their walls (“It’s about states’ rights!”) or Paula Deen types who harbor nostalgia for the elegance of the antebellum South. Epps reads Scripture to his slaves and lingers on a passage calling for them to be beaten “with many stripes” — proof that the Good Book can be employed in the service of manifold Evils. The movie nails all this, and it’s smashingly effective as melodrama. But McQueen’s directorial voice — cold, stark, deterministic — keeps it from attaining the kind of grace that marks the voice of a true film artist. This review originally appeared in the October 21 issue of New York Magazine.